28 (FRI) 29 (SAT) 30 (SUN) July 2017 Naeba Ski Resort, Yuzawa-cho, Niigata Pref. Announcement for the total money collected at FUJI ROCK FESTIVAL’17 and donated towards The Great East Japan earthquake reconstruction assistance project, "Benefit for NIPPON"
It's almost on! Here is guide with various information about getting there and getting in. July 27th is the Festival pre-party! Free entry. 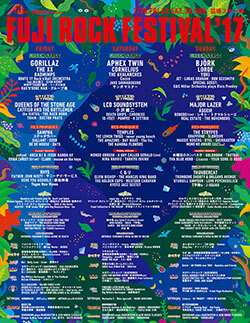 Check the following for Fuji Rock in real time! Autograph sessions at GAN-BAN SQUARE! Meet your favorite artists and see exclusive performances! Information regarding Lost and Found items. Additional artists confirmed! YOUR SONG IS GOOD、Licaxxx and Belly Love! Not just the stages! An introduction to all the different areas at Fuji Rock. All past news topics are here.